3. Fast hair removal, skin rejuvenation, vacular therapy, etc. 2. 1 handpiece with different spot sizes, facilites operation and achieves instant big area treatment. 3. Alarm protection system of water flow and water temperature: stop all working immediately in case of any risk, protecting people & machine against any risk at the first time. 4. User friendly software means that operator error is drastically reduced. 5. Multi program languages for optional: English, Spanish, French ... 16 in total. 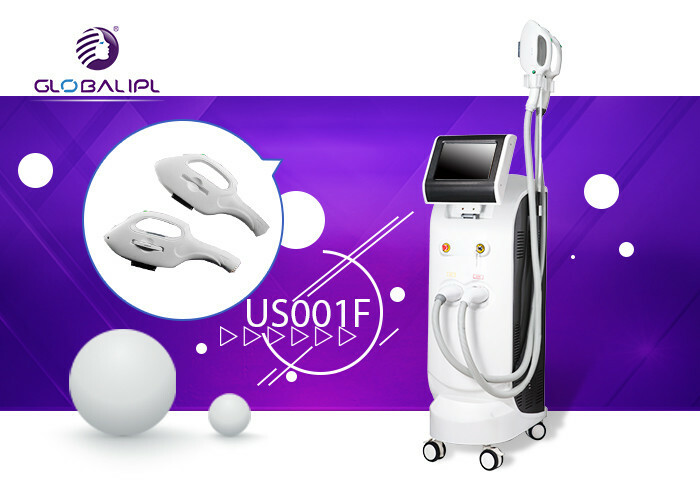 Advanced IPL technology. With it, the perfect result can be expected after several treatments. Additionally, the cooling system inside is effective on the epidermis; this can greatly reduce pain in the process of treatment. 1. New developed luxury handpiece with streamline design & imported parts,grace,strong & durable. 1)USA CPC Water Connector & Germany Harting Electronic Connector. 2)Humanized bending design,maximum protect inner cable from vertical fold,and water flow even smooth for better cooling. 2.Imported water pump,no noise and larger water flow for better cooling,prolong machine life. 3.User friendly menu,maximum facilitate operation. 4.Cooling plate imported from Japan and imported sapphire ensures the best treatment effect. 5.USA imported metal tube ensures high output power and prolongs the lifespan. 6.Intelligent water flow and temperature alarm system protect machine from damage, extend machine's lifetime. 7. Greatly effective to unwanted hair removal, both thick black hair and tiny hair, comfortable during the treatment. 8. The state-of-the-art IPL filters ensures safe and effective multifunction. Shipment: We can offer the door to door service by air or by sea, just depend on your actual request. 4. Delivery: We can offer the door to door service, by air or by sea depending on your actual request, such as DHL, UPS, TNT… by air.